While the Euro zone plunges into meltdown and the governor of the Bank of England predicts the worst crisis in the UK since the depression, innovative new ideas based on relationships of solidarity between countries are being successfully put into practice in the countries of the Bolivarian Alliance for the Peoples of our America (ALBA). Trade between these countries is being turned into a tool to combat poverty, rather than the enrichment of powerful countries at the expense of the systematic impoverishment of poorer countries. Membership of ALBA has played a key role in the success of Nicaragua in rebuilding its economy, and infrastructure and implementing social programmes that have contributed to reducing high levels of poverty. Nick Hoskyns from London has worked in Nicaragua since 1997 with rural cooperatives and is now quality manager for ALBANISA, an ALBA food social enterprise. He talks to David McKnight, from the Wales Nicaragua Solidarity Campaign. .
ALBA is made up of Venezuela, Cuba, Nicaragua, Bolivia, Ecuador, the Dominican Republic, Antigua and Barbados, St Vincent and the Grenadines. It was set up to counteract the free trade agreements promoted by the western world; in Latin America it was ALCA (the Free Trade Area of the Americas). ALBA is everything that ALCA and the free trade agreements are not. Free trade agreements only talk about economics, only talk about trade, ALBA is all about the poor, solidarity, Latin American peoples coming together to resolve their problems. ALBA means ‘daybreak’, hope, it’s the first rays of the sun. In a country like Nicaragua that has always had people against it – it’s always been a struggle, within ALBA you have a group of countries willing to understand revolution and in a very practical sense willing to support you and help you. I think it’s also important to understand it’s a real southern initiative. How does ALBA differ from other trading blocs like the European Union for instance? The difference is that ALBA is about giving and supporting and solidarity. It’s about how countries help each other to develop and it’s about how poor Latin American countries work together to resolve their problems. When ALBA countries get together, it’s not a negotiation of who gets most and who gives least, it’s the complete opposite, it’s what can they do, how can I help you? …in the European Union when you hear that countries go to negotiate they are mandated to get the best possible deal for their country. Venezuela sells its oil to Nicaragua and Nicaragua pays the market price but 50% of the value of the oil is on payment terms of 25 years at 2% interest. Nicaragua invests this money in infrastructural projects – roads, energy – and long-term development. The other 50%, that Nicaragua has to pay in 90 days, Venezuela said to Nicaragua ‘you can pay me back in cash or if you’ve got anything that Venezuela needs then we’ll take your products’. So Nicaragua is now selling very large amounts of products to Venezuela under that fair trade agreement. The major product is meat and livestock, then there’s coffee and beans then there’s milk, cooking oil and sugar. The priority is given to the small farmers organised into cooperatives. The principle is making sure that the farmers can produce at a price which works for them but also making sure that consumers get a good quality product at a fair price. Fair trade within ALBA is making an enormous difference to both peoples. In 2008 Nicaraguan exports to Venezuela totalled $27 million. That went up to well over $250 million in 2010 and we are heading for way over $350 million in 2011. 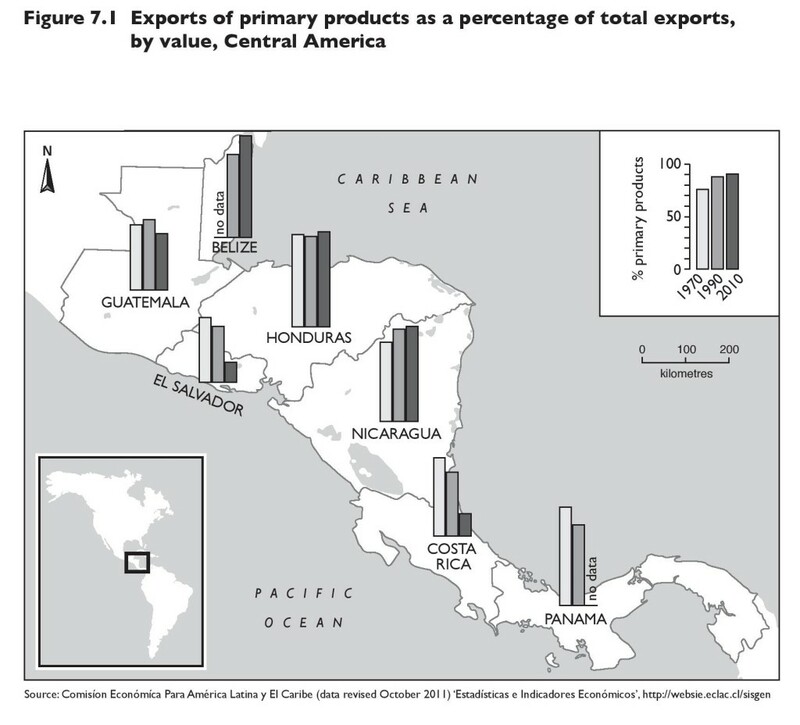 Venezuela has now become the second most important destination for Nicaraguan exports. The first of course is the US. So the importance of the US to the Nicaraguan economy can’t be minimised but this is a very different trading agreement. It’s an integrated approach with lots of different programmes, very specific, very concrete, that benefit the Nicaraguan population. There was Miracle Operation, where every Nicaraguan who had eye problems such as a cataract has had a free operation here in Nicaragua or they’ve been flown to Venezuela or Cuba. People who thought they were never going to have full vision again, have had their sight given back to them. And that’s a successful programme right through all the ALBA countries. Then there’s the solidarity bonus, where employees who earn less than C$5000 (£150) get a solidarity bonus which is just a top up or a bond, now worth C$700 a month, this is particularly important for low paid women workers. Electricity was an enormous problem in Nicaragua – we used to have eight hours power cuts a day – we were trying to run our sesame and coffee plants and you never knew when the energy was going to be cut off and now we have got energy production funded through ALBA. …it is an integrated approach coming from so many different angles. Poverty has gone down 7%. Exports are growing at around 30% ay year. The economy is growing at 4% whereas in the West it is stagnating. So ALBA is working for people directly and it’s also working for the economy as a whole – for big businesses, for medium businesses, for small businesses and for individual families. It really feels like Nicaragua is on the move. It is very important for Venezuela to have a secure market for its oil. Also Nicaragua provides a great ally within Central America that speaks out on international issues in favour of the ALBA countries. Nicaragua is out there at the United Nations giving a clear, strong voice – an independent opinion from any lobbying from Western countries. 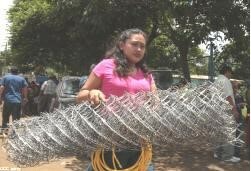 The cooperative movement in Nicaragua has been identified as a possible model for the whole of ALBA. I’ve personally been privileged to have been involved in an interchange between the Cuban and Nicaraguan cooperative movements, Cuba is looking at the cooperatives in Nicaragua as a model for them in the development of their economy. So that’s a great privilege for Nicaragua and Nicaragua is just there, chomping at the bit to help and give something back to any of the ALBA countries. And I truly believe that in the future, Nicaragua is going to provide a real model for the other ALBA countries of how to work in a way that is inclusive, incorporating large companies, medium-sized companies but without compromising commitments to the small farmers and the cooperatives. I think that’s going to be a valuable example for the rest of ALBA. The thing to understand about ALBA is that it’s about doing and it’s about achieving. So in Nicaragua where you had power cuts, it was decided to invest in energy so there were no more have power cuts. They decided that all disadvantaged children should get at least one good meal a day, that’s happening. Because of the rains and the hurricanes it was decided that everyone should have a roof, ALBA Plan Techo [Roof Plan] provides 12 large corrugated iron sheets to each family that needs it. ALBA is a group of countries that’s there to develop and to make a difference for the poor and disadvantaged. And, in Nicaragua it’s successful. This is real and it’s working and it’s developing. The following section also appears in the book under the same sub-heading, but the section which appears her is a much fuller version. efforts at regional integration at this time came to nothing. Although dependency theory draws on the work of Marx, it is particularly associated with economic historian and sociologist André Gunder Frank, although his work simply became the most famous expression of what many had been thinking and saying around Latin America for some time. Dependency theory argues that western capitalist countries have grown as a result of the expropriation of surpluses from the Third World, especially because of the reliance of Third World countries on export-oriented industries (coffee, bananas, bauxite and so on) which are notoriously precarious in terms of world market prices. The theory uses the notion of core–periphery relationships to highlight the inequality, where the core is the locus of economic power within a global economy. André Gunder Frank takes matters one step further in his notion of the ‘development of underdevelopment’ which stresses that it is the underdevelopment of the structures in Third World countries created by First World capitalist development that creates dependency – see Cristóbal Kay and Walter Rodney. As anthropologist Arturo Escobar bluntly asserts, “Europe was feeding off its colonies in the nineteenth century, the First World today feeds off the Third World.” In other words, dependency theorists see development of the core through exploitation of and extraction from the periphery, leaving the periphery in a constant state of underdevelopment. Above all else, theories of dependency are in general agreement that the interdependence resulting from global economic expansion and the suppression of autonomous growth results in unequal and uneven development. The dependentistas explain Latin America’s failure to industrialise as a result of this unequal power relationship between the core (USA and Europe) and the periphery (Latin America, and of course Africa and parts of Asia). In the 1970s, attempts to industrialise for the sake of independent development changed motivational tack as flows of international finance into the region became the major stimulus to limited industrial development. The debt crisis which followed “these vast flows of credit” is well documented elsewhere and seemed to represent a new form of dependency – ‘new’, but as noted above by Galeano, one that was already well-rehearsed in the nineteenth century. In the late 1970s and particularly through the policies pursued by the Reagan-Thatcher axis of the early 1980s, Third World attempts at ISI were replaced by an export-oriented model of development, “building on ideas of free trade and foreign direct investment (FDI) as the way forward for indebted nations.” The simplistic notion of comparative advantage was used to justify the need for Third World nations to produce goods or crops for which they have a natural advantage. This effectively justified the continuation of the colonial model of development, and the debt crisis served as a mechanism to ensure the continuation of a relationship of First World dominance over Third World nations. The economic model mandated by the USA and Britain in the 1980s was later imposed on developing countries by the international financial institutions (IFIs) – the World Bank, the International Monetary Fund (IMF) and in Latin America the Inter-American Development Bank (IDB). The model advocated cuts in public spending and the privatisation of state-owned enterprises, especially utilities such as energy companies. Free trade and economic growth are regarded as essential pre-requisites of development by the supranational and national agencies: the World Bank, IMF, World Trade Organisation (WTO), Organisation for Economic Cooperation and Development (OECD), European Union (EU) and G8 governments. The discourse of these agencies is commonly referred to as the Washington Consensus and its ideology of free trade is captured in the term neoliberalism. Free trade is synonymous with economic globalisation which is synonymous with the spread of capitalist relations of production, and whichever of these terms is employed, it amounts to an ideology. Neoliberalism sees development as a single linear progression of economic growth and well‑being, a model that has been portrayed by a number of theorists as a series of steps or stages (such as Rostow’s The Stages of Economic Growth) to the ‘promised land’ – a developed state. There is an almost universal acceptance, at least among those who hold power, that there can be no ‘development’ without economic growth and no economic growth without free trade, an equation that commands near universal respect but which development scholar Gilbert Rist and others insist needs to be questioned. The notion of free trade itself, however, manages to hide the uneven and unequal economic interdependencies manifest for example in trade protectionist measures adopted by First World governments. In this regard the hegemony of the United States of America is noteworthy, though equally the power vested in the WTO, the G8 and key trading agreements (especially the North American Free Trade Agreement and the Association Agreement with the EU) should not be underestimated. Free trade fundamentally requires open and deregulated markets which supposedly provide a level playing field to those who operate business such that there exist no restrictions to trade. As the WTO explains, “In order to do business as effectively as possible, companies need level playing fields so that they can have equal access to natural resources, expertise, technologies and investment, both within countries and across borders.” In theory this would allow national economies to specialise in producing goods or providing services that they are supposedly best at producing or providing. They would export these goods or services and import the things that they are not so good at producing. This is the notion of comparative advantage, one of the theoretical planks on which the ideology of free trade is built. In the existing circumstances of inequality, it can be forcefully argued that there can be no such thing as free trade or a level playing field. The deregulation of the local business environment – deregulation is another of the theoretical planks on which the ideology of free trade is built – to create the hypothetical level playing field actually creates the conditions which clearly favour those with access to wealth and resources. Stealing Bernard Crick’s phrase, we might describe deregulation as “the dramatic bonfire of the controls needed to make free markets tolerable”. Without those controls which protect the national industries, those who stand to gain are those who already have the advantage of wealth and power that enable them to access even greater levels of capital and technology. Elsewhere in the world beyond Central America, the idea of promoting a strategy of import substitution industry had been dealt a blow by the rise of the South-East Asian ‘tiger’ economies, and after the 1970s few nations in the world clung onto or placed great hope in achieving development through the rise of an economy led by national industrial growth. For those nations which did not willingly embrace neoliberalism, it was forced upon them by the USA and Europe and by the debt crisis. The crisis was and still is managed by the world’s two major international financial institutions (the IMF and the World Bank) in which the interests of the two major political centres (the USA and Europe) hold sway. The debt crisis was managed through structural adjustment programmes which later metamorphosed into Poverty Reduction Strategy Papers (PRSPs), although the PR part of the initials might have more accurately signified ‘Public Relations’. Through these the international financial institutions imposed on indebted nations loan conditions which included trade liberalisation, the deregulation of industry and the privatisation of state-owned industries and services. This is what Martin Khor (Director of the Third World Network) describes as the ‘de-industrialisation’ of the developing world, preventing governments from managing their country’s basic services such as health, education and water and from protecting the livelihoods of small producers and manufacturers by placing tariffs on unfairly subsidised imports. 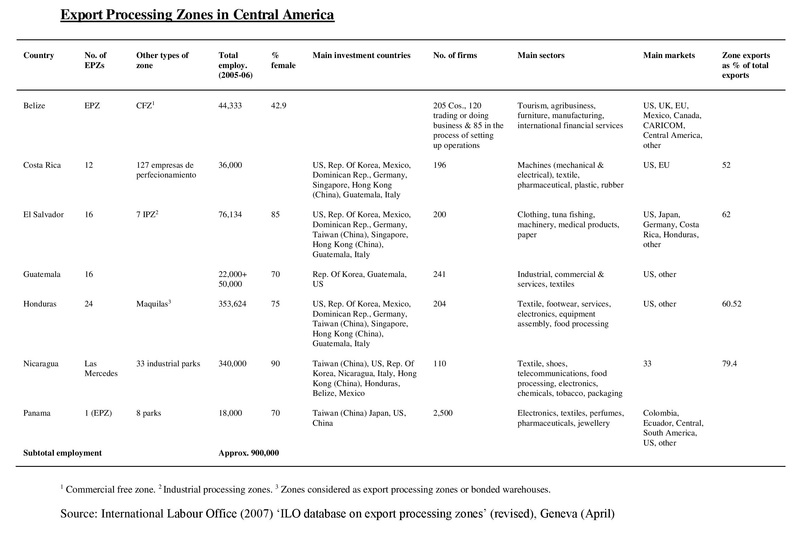 But how does this process of de-industrialisation fit with the evidence of increasing manufacturing importance in national statistics for the Central American economies? 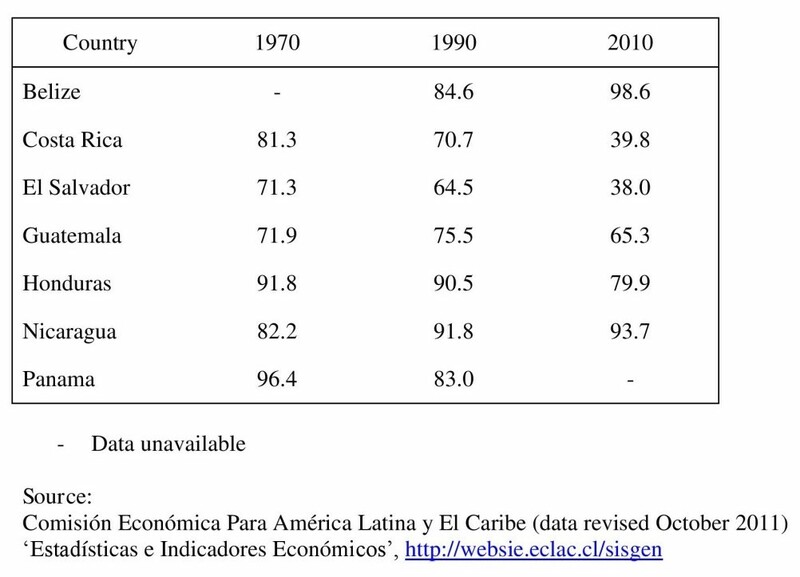 The Table on Exports of manufactured goods as a percentage of total exports demonstrates that from 1970 to 2010 the value of the export of manufactured goods as a percentage of all exports increased in five of the seven countries. The answer to the apparent contradiction is found in the maquilas or sweatshop assembly factories which have been established in the region over the decades since the 1970s. As labour costs increased in the developed capitalist or metropolitan nations, transnational corporations (TNCs) found it profitable to re-locate the most labour-intensive elements of their production to low-wage countries which would serve simply as a platform to receive components which were altered in some way and then ‘sprung off’ the platform either to markets in the metropolitan nations or to other platforms elsewhere in the world where further alterations or additions were made to the product. The maquila process is one which contributes to a globalised economy rather than to a national economy. Very often there is little advantage accruing to the host nation other than the employment opportunities offered to local populations, but the maquilas are associated with extremely poor wage levels and abusive conditions of employment. The development of maquilas is covered again in more depth later in this chapter. 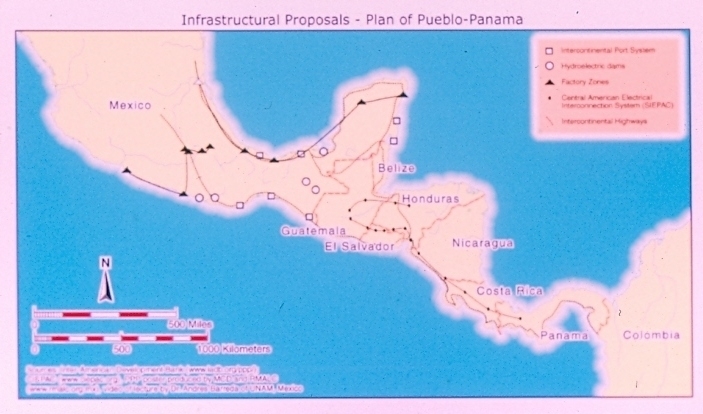 To some extent this inequality of access to modern business infrastructure is illustrated by the example of the Plan Puebla-Panama given in the following section. This brings us very suitably to ask the question: how have the effects of these global policies shown themselves in the economies of Central America? And that in turn brings us to an examination of the most recent twenty years of free trade treaties negotiated between the Central American nations and other trading blocks. Eduardo Galeano (1973) Open Veins of Latin America: Five Centuries of the Pillage of a Continent, New York and London: Monthly Review Press, p. 218. Katie Willis (2002) ‘Open for business: strategies for economic diversification’, in Challenges and Change in Middle America, edited by Cathy McIlwaine and Katie Willis, Essex: Pearson Education. Victor Bulmer-Thomas (1987) The Political Economy of Central America Since 1920, Cambridge: Cambridge University Press, pp.80-81. André Gunder Frank (1967) Capitalism and Underdevelopment in Latin America, Monthly Review Press, London. Frank, A. G. (1966) ‘The development of underdevelopment’, Monthly Review 18, 4: 17–31; (1969) Latin America: Underdevelopment or Revolution, New York: Monthly Review Press; (1970) Lumpen-Bourgeoisie: Lumpen-Development, Dependency, Class, and Politics in Latin America, New York and London: Monthly Review Press. Kay, C. (1989) Latin America Theories of Development and Underdevelopment, London: Routledge. Walter Rodney (1988) How Europe Underdeveloped Africa, London: Bogle L’Ouverture Publications. Arturo Escobar (1995) Encountering Development, Princeton: Princeton University Press, p.83. Ron Ayres and David Clark (1998) ‘Capitalism, Industrialisation and Development in Latin America: the Dependency Paradigm Revisited’, Capital & Class, 64 (Spring) (pp.89-118), London. (Quote from p.110). For example, see: Duncan Green (2003) Silent Revolution: the rise and crisis of market economics in Latin America, Latin America Bureau; Susan George (1988) A Fate Worse Than Debt, Penguin; Susan George (1992) The Debt Boomerang, Pluto Press; and refer to the work of the World Development Movement and the Third World Network. Rostow, W. (1960) The Stages of Economic Growth: A Non-communist Manifesto, Cambridge: Cambridge University Press. Gilbert Rist (1997) History of Development, London: Zed Books. WTO/OMT (1995) GATS and Tourism, Madrid: WTO/OMT, p. 1. David Ricardo (1817) The Principles of Political Economy and Taxation, London, J.M. Dent, 1973. Teresa Hayter (1982) The Creation of World Poverty: An Alternative View to the Brandt Report, London: Pluto Press, p.96. Bridget Wooding and Richard Moseley-Williams (2004) ‘Worlds Apart’, Interact, Spring 2004. London: Catholic Institute for International Relations, p. 9. Fred Rosen (2003) ‘Changing the terms of the debate: a report from Antigua’, NACLA Report on the Americas, XXXVII (3), November/December 2003, page 25. New York: North American Congress on Latin America. Wayne Ellwood (2004) ‘The World Trading System’, New Internationalist, no. 374, December 2004, Oxford: New Internationalist. Oscar Guardiola-Rivera (2010) What if Latin America Ruled the World? How the South Will Take the North into the 22nd Century, London: Bloomsbury, p.3. Bernard Crick (2004) ‘How the rich stole the dream’, The Independent, London, 11 June 2004. Crick was referring to the manipulation of the capitalist tax system to benefit the rich, but in the context of the development of the capitalist economic system. We consider that the contexts of his remark and of ours are similar enough for it to be used to describe deregulation. Martin Khor (21 June 2006) ‘Beware of NAMA’s slippery slope to de-industrialisation’, TWN Info Service on WTO and Trade Issues (June 06/18), www.twnside.org.sg/title2/twninfo431.htm (accessed 30.07.12).